In the first years following the end of the Revolutionary War, the Rutgers and de Lancey estates abutted one another. As the city encroached on their lands, the families named new streets for themselves, including Rutgers Street, Henry Street (for Henry Rutgers), and Catherine Street, for Catherine Rutgers. Division Street marked the line between the two estates. And little Oliver Street was named for Oliver de Lancey, brother of James de Lancey, for whom Delancey Street was named. By the 1840s the streets were lined with what were mostly working class homes. Among them was No. 25 Oliver Street, a 23-foot wide, two and a half story house clad in Flemish bond brick. The neighborhood was populated by Irish immigrants, and the Federal style house was owned by Thomas Coman. Coman brought his family from Ireland to New York in 1838 when his son, also named Thomas, was just two years old. He was determined that his son would succeed and while other boys in the neighborhood left school early to work, young Thomas not only stayed on but was later enrolled in the New York City College. In 1847 Florence McCarthy was living across the street at No.22 Oliver Street when she fell behind in her personal taxes by $10.53. By 1853 it appears she was renting a room from the Coman family. She was, by now, a trustee in the Fourth Ward School District. Florence was still living here five years later when she had risen to the position of commissioner. Young Thomas Coman graduated from City College in 1856. That same year he joined the volunteer Eagle Engine Company No. 13. He briefly worked for The New York Herald, and then at the age of 26 he took a job as clerk in the Post Office. But Thomas Coman was politically motivated and in 1866 he was elected to the New York City Board of Alderman. It was the beginning of a long political career marked by a meteoric rise. Only two years later he became President of the Board of Alderman and, that same year, when Mayor Hoffman resigned, Thomas Coman stood in as Acting Mayor. He held the position for about a year. In 1871, the same year that Coman was re-elected to the Board of Alderman, he filed plans to enlarge the Oliver Street house by adding a third floor. Although his intentions, as described in the Real Estate Record and Builders’ Guide on July 8, included a mansard roof; the completed renovations stopped short of that. It was most likely at this time that up-to-date Italianate railings were added. The Tammany Hall Democrat would sometimes find himself embroiled in the scandals that became the organization’s hallmark. The New York Times—notoriously anti-Tammany—initiated an investigation regarding the $31,730.15 bill presented to the City in 1872 by the J. McBride Davidson safe company. On February 1, 1872 the newspaper published a list of the safes, their costs and where they were delivered. “This account is as clear a proof of barefaced swindling as any which could possibly be laid before the public.” Included in the list was the $650 “Secretary Safe” delivered to Thomas Coman at No. 25 Oliver Street on October 11, 1871. The equivalent cost of the Coman’s safe today would be around $13,000. In 1873 he was indicted, along with other Tweed Ring conspirators, for corruption in the construction of the Courthouse. In 1881 Coman’s wife, Martha, sold No. 25 Oliver Street to the Church of St. James, located just a block away. Almost simultaneously the Church purchased No. 21 Oliver Street for the same price. Before long it would acquire No. 23 as well. When St. James Church purchased No. 25 Mary and Sarah Corrigan were living at No. 135 Henry Street. The sisters taught at Primary School No. 12 at No. 83 Roosevelt Street, along with Mary G. Meagher. At the time Mary L. Corrigan was earning $600 per year and Sarah made $516. Mary Meagher was earning $636 a year. Even though she was earning more than the Corrigan sisters, it appears finances were tight. That same year Mary Meaghan borrowed $327 from Jordan & Moriarty, using her furniture as collateral. By 1883 all three women were living at No 25 Oliver Street, renting from the church. The following year, in April, the church announced its intention of combining Nos 25 and 23 Oliver Street for use as its rectory. Although the plan was never carried out, it was most likely at this time that the two houses acquired their matching cornices. Little Oliver Street however, while humble, was respectable. In 1904 an up-and-coming politician, Alfred E. Smith was elected to the State Assembly. He and his family were living in a five-room, third-floor walk up at No. 28 Oliver Street. By 1909 the apartment was too crowded for the family of seven. When funeral director Henry McCaddin moved from the former rectory at No. 25 Oliver Street to No. 63 Madison nearby, Smith leased No. 25 from St. James Church. Smith was wildly popular within the mostly Irish neighborhood. He relentlessly worked for improvements of the Lower East Side, including rent control, tenant protection and low-cost housing. In an effort to teach children to save money, he and Assembly Speaker Tom Foley (who also lived on the block) announced free gifts to neighborhood children. On June 17, 1913 The New York Times reported that “Three thousand children gathered yesterday at the doorstep of 25 Oliver Street…The gifts were to be distributed at 4 o’clock, but the collection of humanity took so long to be sorted and squirmed and screamed so much and so mightily that it was an hour later before sufficient order prevailed to hand out the first present.” Each child received a tin bank, painted red and green, with a key and a nickel to start their savings. By 1916 Oliver Street was popularly known as Politicians’ Row. On April 21 The Evening World noted that in addition to Smith, “In the row are the homes of Clem Driscoll, Senator Reardon, Magistrate Nolan, Tom Foley and Former Coroner Hayes.” But Alfred E. Smith was the most popular. On November 7, 1917 The Sun called him the “idol of Oliver street” and said he was “pretty well liked wherever he is known, amateur actor, present Sheriff, and former leader of the Assembly.” That same year Smith, like Thomas Coman before him, was elected President of the Board of Aldermen. But Smith did finally leave the Oliver Street house. Somewhat ironically, it was leased by St. James Church to Henry McCaddin, who had preceded Smith here. McCaddin moved his funeral home into the house once again. In 1928, when Smith’s daughter, Catherine, was married, old Oliver Street neighbors were not forgotten. Among the 15 invitations to the Albany wedding that arrived at Oliver Street addresses was one for Mr. and Mrs. Henry McCaddin. In 1941 the first of 18 American Liberty Ships was built. The transport ships were initially intended to help replace the English ships torpedoed by German U-boats. Construction on the SS Alfred E. Smith commenced on November 27, 1944. Prior to its launch in 1945 a slab of the bluestone sidewalk in front of No. 25 Oliver Street was removed in an official ceremony. The stone was placed within the new ship. The metal window lintels and Italianate ironwork are gone. The remaining lintel over the doorway is seriously rusting. Although the house was designated a National Historic Landmark in 1965 and a plaque applied to its brick façade; the Alfred E. Smith residence is a bit worse for the wear. The house that one of New York State’s most popular called home, and where throngs of New Yorkers and children forced the closing of streets, goes mostly unnoticed and shows serious signs of neglect. As the century drew to a close No. 251 was once again being used as a private home. Brothers Francis Thomas J. and James J. Nealis lived here in a neighborhood that was seeing immense change. The wide Greek Revival homes on East Broadway had been built for financially-comfortable families. By the 1870s the neighborhood had filled with Irish immigrants, who were now being pushed out by the throngs of Jews fleeing persecution in Europe. But the plans of Graul & Frohme lay on the drafting table unused. Nealis sold the property to Simon Liboritz, his neighbor next door at No. 253. On June 9, 1894 The Record and Guide reported that Liboritz was going ahead with plans to replace the house with a five-story apartment building; but he had changed architects. Plans for the $20,000 structure were now underway, it said, by Schneider & Herter. The architects were among the favorites of the German-Jewish property owners in the Lower East Side. Ernest W. Schneider and Henry Herter would eventually design more than a hundred tenement buildings as well as commercial structures and two synagogues. Their resulting five-story building would have been just another brick tenement had it not been for their exuberant terra cotta ornamentation. Each red brick story was delineated by a contrasting stone course. But elaborate terra cotta in the form of portrait panels, pediments and an explosive tympanum with a full-relief winged bust were more expected in a social or music hall than in an apartment building. The overblown ornamentation disguised the meager means of the residents inside. One of these in particular, however, would rise above his humble beginnings. Rudolph Marks Rodkinson was born in Odessa, Russia in 1866. At the age of 15 he moved to London and joined the Jewish theater, using the stage name Rudolph Marks. The boy played with such famed Yiddish actors a Jacob Adler and Abraham Goldfaden. Possibly through their encouragement—both of whom had found great success in New York—Marks arrived in the city four years later. Now 19 years old, Marks succeeded. The New York Times would later remember that he “appeared in productions in the old Bowery theatres with Max and Sophie Karp, Thomashefsky, Adler and Bertha Kalisch.” He tried his hand at producing, as well, staging The Bowery Tramp at the Oriental Opera House. But Marks felt he could better himself in his adopted country. 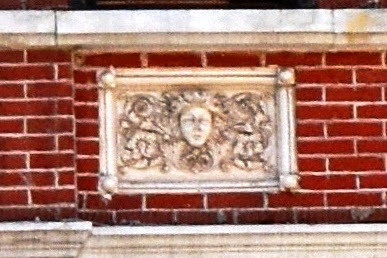 The year before Simon Liboritz completed his East Broadway apartment building Marks was studying law at the University of the City of New York. Rudolph Marks was one of the first residents in No. 251 East Broadway. In 1898 he was admitted to the bar. His theater background proved advantageous to his new career. Within months he was representing David Kessler, manager of the Thalia Theatre in his divorce case, and throughout the next decades many of his clients would come from the entertainment industry. Marks’ hard work and determination resulted in an iconic American dream story. Specializing in corporate law, he built up a sizable practice at No. 1440 Broadway. By the time of his death in 1930 he and his family, including two daughters and a son, lived not in a five-story walk-up; but in a comfortable home in Cedarhurst, Long Island. His son was studying medicine at Cornell University and one of his daughters had recently graduated from Barnard College. Even the smaller panels were highly decorated. Another Russian Jewish resident living at No. 251 when Marks first moved in was Dr. H. Solotaroff. 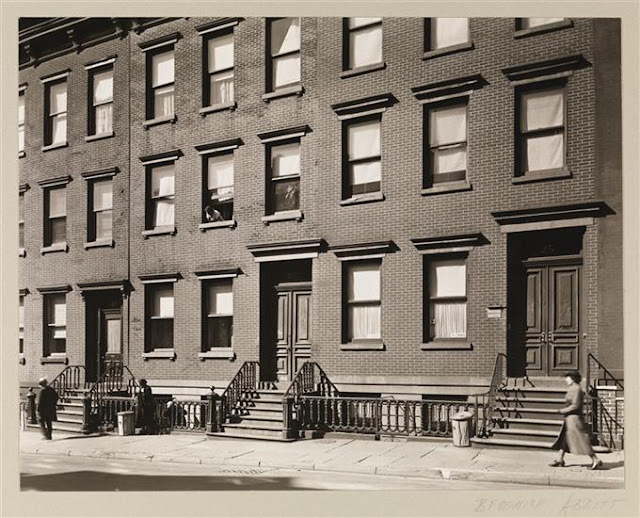 Many of the residents of the neighboring tenements were poor and ill-educated; a condition worsened by their inability to understand or speak English. Despite Solotaroff’s selfless work among the impoverished community; his political bent may have alienated many. An anarchist and sympathizer of the Russian Nihilists, he was active in the extremist political group. Dr. Solotaroff was among the speakers at an Anarchist meeting on January 27, 1904 in New Irving Hall on Broome Street. 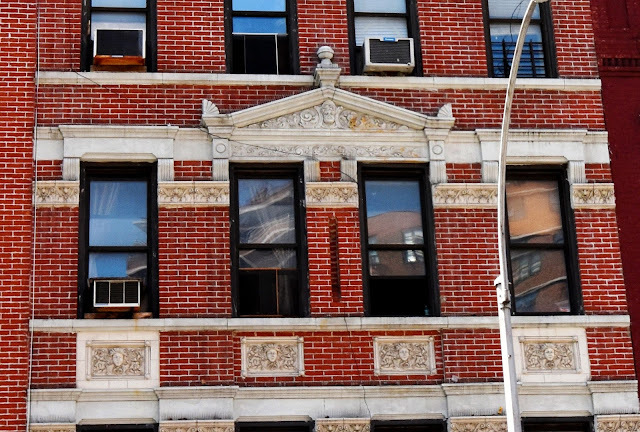 The East Broadway apartment building continued to house immigrant families for decades. In 1931 40-year old Louis Wolkofsky’s family lived in a first floor apartment. With him, along with his wife, were 12-year old Anna; Esther, 9; Aaron, who was 8; and 4-year old Miriam. The Wolkofsky apartment was located directly above the basement boiler room. On March 17 that year Anna was sick in bed. Suddenly the apartment was rocked by a tremendous blast. The boiler below had exploded and a fire ensued. Anna was thrown from the bed onto the floor and Esther was burned. When the police arrived they found Louis Wolkofsky on the floor unconscious and bleeding. The entire family was removed the Broad Street Hospital for shock and injuries. Sadly during the latter 20th century the stoop and entrance were removed, replaced by a half-hearted attempt to disguise the alteration. An industrial-type doorway was installed at the basement level. In 2002 and 2003 repair of the façade resulted in the extraordinary terra cotta work gleaming once again. It unavoidably highlighted the lost entranceway and ungainly patching, as well; and included encasing the stone base in hideous faux-stone. But despite the losses, Schneider & Herter’s design survives—a reminder of a time when some architects strove to give residential dignity even to those of meager means. In 1887 architect Hugh Lamb joined with speculator J. H. Andrew to erect three high-end homes on West 71st Street between Central Park West and Columbus Avenue. Of course Lamb, with his partner Charles Rich, would design the row. Lamb & Rich produced three delightful Queen Anne style homes which they splashed with touches of Renaissance Revival. The A-B-A plan, along with the balanced openings and decorative elements flew in the face of the asymmetry expected in the Queen Anne style. The balance was, however, thrown off with the paired stoops of Nos. 26 and 28 that left the entrance to No. 30 sitting alone. The architects provided subtle differences between the two end homes. The second floor cornices were slightly different—one bracketed, the other not. The projecting bay of No. 26 was clad in metal; that of No. 30 was faced in brownstone. Fishscale tiles covered the gable at No. 26, while No. 30’s was clad in brick. In the middle, No. 28 featured blocky brownstone quoins and lintels around the second floor openings. At the fourth floor an enchanting brick balcony serviced a columned loggia. The trio fully represented the edgy domestic architecture appearing on the west side of Central Park. The chunky brownstone of the stoop, now delightfully growing moss, was contrasted by delicate carving. As the houses were being erected, Lamb & Rich were designing the residence of the widow Elizabeth Milbank, next door at No. 24. Two party wall agreements dated May 5 suggest that Hugh Lamb would own No. 26 while J. H. Andrew would take possession of No, 26. The agreements were between Hugh Lamb and Elizabeth Milbank for Nos. 24 and 26; and between Lamb and Harriet N. Andrew for Nos. 26 and 28. Hugh Lamb was arguably nearly as active in real estate dealings as he was in architecture. The row was completed in 1888 and all three homes would see a variety of residents and sometimes a rapid turnover of owners. No. 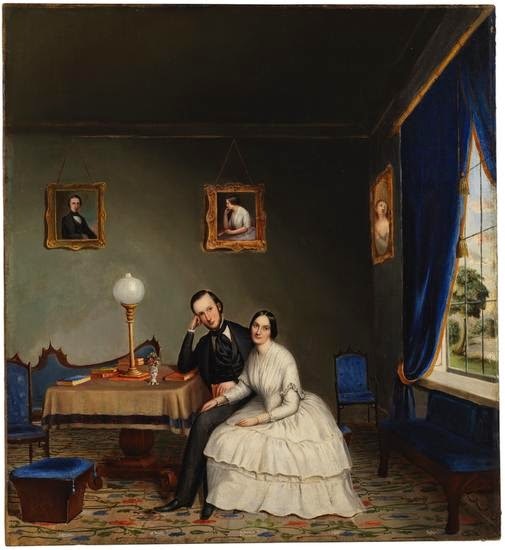 26 became home to Arthur Wellesley Watson and his wife, Anna Josephine. The wealthy Watson was a partner in the importing firm of Passavant & Co. located at No, 320 Church Street. The couple had three daughters and attended the nearby St. Agnes’s Chapel on West 91st Street. 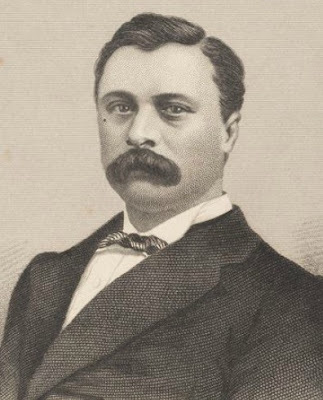 In 1894 Governor Roswell P. Flower found himself in the center of a political scandal when he refused to appoint a special Deputy Attorney General to investigate corruption in the office of District Attorney of New York County, John R. Fellows. The specific purpose of the appointment would be, according to The New York Times, “to prosecute alleged crimes in this city.” His hard-line stance put the Governor in the midst of a political maelstrom that threatened to unseat him. A grand jury was chosen to investigate “the failure of Governor Flower to appoint a Deputy Attorney General to prosecute election law violators and corrupt officials.” Sitting on that grand jury was Arthur W. Watson. Watson added to his prestige when he was elected to the board of directors of the Colonial Bank at 83rd Street and Columbus Avenue in 1898. But the Watson social hob-nobbing was best illustrated by a special cable to The New York Times on July 5, 1902 from London. It reported on the American Ambassador’s Independence Day reception at Carlton House Terrace the day before. Among the exulted guests that afternoon were the Duchess of Marlborough, Mr. and Mrs. Bradley Martin, Sir Gilbert and Lady Parker, Count Ward, the Marquise Vistabella, and Arthur and Anna Watson. In the meantime, No. 28 next door had been lost in foreclosure in 1895. Henry W. Kennedy purchased it for $27,000. No. 30 saw a rapid turnover of residents beginning at the turn of the century. Mrs. S. H. Hanford was hosting teas and receptions in 1900; but within a year it was home to Dr. Isaac Hull Platt. On September 11, 1912 Anna Josephine Watson died in No. 26 West 71st Street at the age of 57. Her funeral was held on Friday the 13th at St. Agnes’s Chapel where she had been a member for 20 years. A private train car carried mourners from Grand Central Depot to the burial at Kensico Cemetery. Arthur Watson remained in the house for nine years, selling it to Grace Jaques in September 1921. He moved to the opposite side of Central Park where he died in his home at No. 108 East 73rd Street on July 9, 1929. A chunky brownstone block, carved with a heraldic shield, joins the second floor openings of No. 28. Coffield’s mother, Ellen, lived in the house as well. She died suddenly here on April 20, 1932 and her funeral was held in the house the following Tuesday. By now the 71st Street block was seeing change. The Depression was not kind to the large private residences which required domestic staffs and expensive upkeep. No. 30 had been home for several years to James Frederick Andrews. 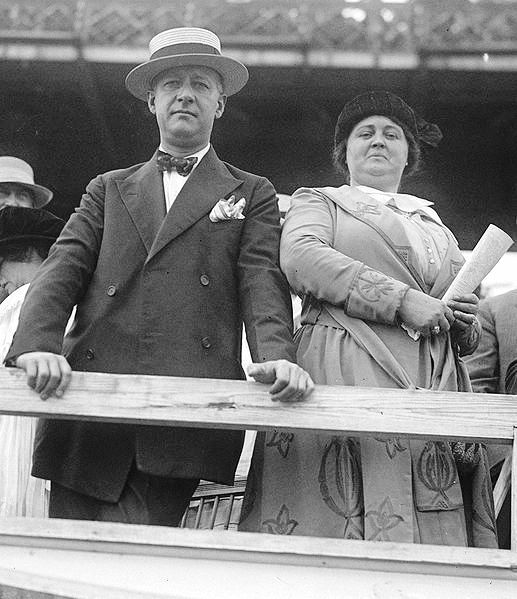 The wealthy widow had taken up the obligations normally reserved for a socialite—such as the reception he gave on January 23, 1914 to introduce his daughter, Doris, to society. The retired stockbroker did admirably, assisted by his daughter’s aunt, Mrs. Cornelius Poillon. “After the reception a dinner and theatre party was given for the receiving party, to which a number of men were asked” reported The New York Times. Less than three months later Andrews would be dead. Following an appendicitis operation at the Polyclinic Hospital, the 68-year old died on February 11, 1915. Five months later the house was leased by the estate. The end of the line had come for the three Queen Anne homes. The Andrews house became “apartments and furnished rooms” by the time of Ellen Coffield’s death. Four weeks before that tragedy would befall No. 30, also now a rooming house. The 81-year old Dr. Stephen Smith Burt, a Professor Emeritus of Medicine and Physical Diagnosis at the Post-Graduate Medical School and Hospital, had been living in a furnished room in No. 30 for some time. In 1930 he had become paralyzed on one side and was unable to move without help. Dr. Burt had never married. His 1899 Recollections and Reflections of a Quarter of a Century detailed his years of teaching at Cornell and the College of Physicians and Surgeons. His family’s deep roots in America were reflected in his memberships in the Society of Colonial Wars, Sons of the Revolution, and the Huguenot Society. On Saturday afternoon, March 26, the invalid doctor was doing just that. But as he attempted to light a cigar, the match fell from his shaky grasp and ignited his robe and pajamas. Unable to extinguish the flames, the terrified old man must have watched them spread. At some point neighbors noticed smoke swirling from the open window and notified the housekeeper. She rushed to the room and found him unconscious and badly burned. An ambulance took him to Roosevelt Hospital where he died soon afterward. Doctors attributed his death to shock. That same year No. 26 was home to blue collars residents like Louis Jackson who earned his living as a “feeder” in the printing plant of Branwell Company, Inc. at No. 406 West 31st Street. Norman Fenster, a casting director, lived here by 1944 when he was in charge of casting and direction of Paul Vincent Carroll’s Shadow and Substance produced by the Actors Equity Association. Also renting an apartment in No. 26 was Russian-born American citizen Brocha Ivova. In 1945 the United States initiated the military occupation of a defeated Japan. Brocha was a civilian employee of the War Department and she was moved to Tokyo for her job. She retained her apartment on West 71st Street while she was abroad. Change in Manhattan is inevitable; and so it was for the three humiliated houses on West 71st Street. No. 26 was returned to a single-family home in 1977 and received a subsequent restoration-renovation in 2011. After having been converted to two apartments per floor in 1949, No. 28 was likewise restored to a single-family dwelling in 1995. Only No. 30, which has sadly lost its stoop, continues its multi-family use with three and four apartments per floor. The houses survive along with a long row of 19th century rowhouses. The charming brick-and-brownstone homes survive as reminders of the development of the Upper West Side when well-to-do families moved into upscale homes that defied architectural convention.